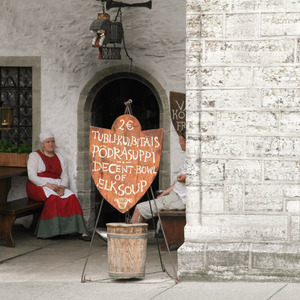 Countless restaurants in Tallinn boasted of authentic medieval fare. But as far as I’m concerned, none of them will ever hold a torch to Kolmas Draakon. Part 4 of the Baltics series (May 2015). Kolmas Draakon deserves a post of its own. Kolmas Draakon is proper kitschy (think serving-ladies dressed in traditional costume doling out massive tankards of ale) without the hefty price tag that other establishments demand. It’s dark, dingy, and an Estonian grandmother slops soup into bowls and sends you on your way. That’s how you know it’s legit. I am useless and forgot to take a photo of the sign, so here it is from someone who’s got their stuff more together than I do. First off, don’t be fooled by the sign. The bowl of elk soup (2€) is more than decent. It’s hearty and warms you to the bone on a rainy May afternoon in the north, and reminds me quite a bit of Kjötsúpa (Icelandic meat soup). Rich, flaky pastries go for 1€ and make a great addition to the meal. For people with more prodigious appetites, 3€ will get you a solid serving of sausages. The less clumsy can also fish pickles out of a giant barrel — knowing me, that would have gone extremely poorly. With these yummy options in mind, I indulged in a lovely spinach pastry and bowl of elk soup: lunch sorted for less than a pint would have cost in London!